The Early Years Learning Framework is an early childhood curriculum framework for early childhood educators. 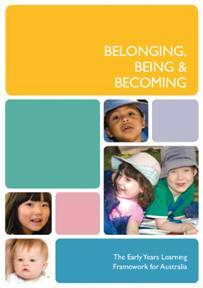 The framework can be downloaded in a 47-page PDF with the compelling title, Belonging, Being & Becoming. The framework is a component of Australia’s National Quality Framework for early education and child care. The NQF introduced a new quality standard in 2012 to improve education and care across long day care, family day care, preschool/kindergarten, and outside school hours care. The Early Years Learning Framework covers the principles, practice and learning outcomes to support and enhance young children’s learning from birth to five years, as well as their transition to school. Within these learning outcomes, educators have multiple guidelines they can use to manage and monitor the progress of their children. It’s a formative assessment approach, mainly using the learning stories format. The Early Years Learning Framework has a strong emphasis on play-based learning. Furthermore, the framework recognizes the importance of communication and language (including early literacy and numeracy) and social and emotional development. Finally, the framework has a focus on successful transition to formal schooling. Further information about the Early Years Learning Framework is available on the Department of Education and Training website. You can also download a copy of the EYLF framework here. * Note: EYLF and the following frameworks are all included by default in Educa. You can also build your own customized linking sets such as your service philosophy, Resource tracking, Montessori, Observation type, Theorists. Educa is proud to be able to provide a customisable online solution that supports the EYLF planning and documentation requirements. Educa also has Australia’s Professional Teaching Standards uploaded as part of its teacher portfolio module for professional development – learn more here about teacher registration by state. Educa runs regular ECE webinars — see our ECE webinar schedule here. Check out our Professional Development summary for other ECE PD options in Australia. The Council of Australian Governments has developed My Time, Our Place – Framework for School Age Care in Australia (The Framework) to assist educators to provide children with opportunities to maximize their potential and develop a foundation for future success in life. In this way, the Framework will contribute to the Council of Australian Governments vision that: “All children have the best start in life to create a better future for themselves and for the nation.” Download the My Time Our Place framework here. The National Quality Standard (NQS) is a key part of the National Quality Framework (NQF). It sets benchmarks for early childhood education and care, and outside school hours care services in Australia. Read more about the Australian Children’s Education & Care Quality Authority and the NQS benchmarks here. It gives services and families a better understanding of a quality service, therefore helping families to make informed decisions about the services providing education and care to their child. The NQS brings together the 7 key quality areas that are important to outcomes for children. There are changes coming to the National Quality Framework, effective October 1, 2017. Learn more here. The NT Preschool Curriculum provides the next level of focus and detail, within the framework of the EYLF, to assist teachers and early childhood professionals to plan and program for children from 3-5 years of age. It also outlines the teaching practices and phases of learning. These can assist transition for children moving from child care settings to preschool and for Transition teachers to build continuity of learning for children when they move from preschool to the Transition class. Learn more about the NY Preschool Curriculum here. Learn more about the Queensland Kindergarten Curriculum here. Foundations for Success is a practical guideline to extend and enrich learning for Aboriginal and Torres Strait Islander children in the kindergarten year. The Foundations for Success guideline builds on the principles, practices and outcomes outlined in Belonging, Being and Becoming – the Early Years Learning Framework (EYLF). The intention is to uphold the EYLF vision: ‘all children experience learning that is engaging and builds success for life’ (Commonwealth of Australia 2009a, p. 7). Used alongside the EYLF, Foundations for Success provides educators with additional guidance to implement a holistic program that extends and enriches learning. Download info here. The Victorian Early Years Learning and Development Framework (VEYLDF) advances all children’s learning and development from birth to eight years of age. The VEYLDF provides early childhood professionals with a common language for describing outcomes for children. In addition, it describes practice principles to guide early childhood professionals to work together, with children and with families to achieve the best outcomes for every child. Learn more about the VEYLDF here. Educa helps manage and communicate EYLF and curriculum goals.